Four years ago, while I was traveling to the coastal small town of Lasem, I was determined to go to the tomb of Han Siong, a Chinese man who sailed all the way from China to Java in the late 17th century. Born in 1673 in Fujian Province, South China, Han Siong became the first “Han” in Java. What’s interesting about this man that had made me come to his grave was his curse toward his descendants. For centuries, there has been no Han clan allowed to live in Lasem. 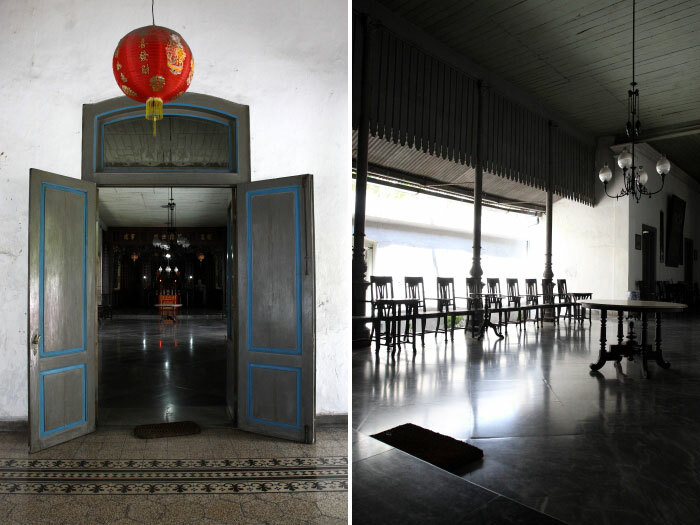 Last September, while traveling to Surabaya, East Java, I came by a well preserved old Chinese house of prayer on Jalan Karet. 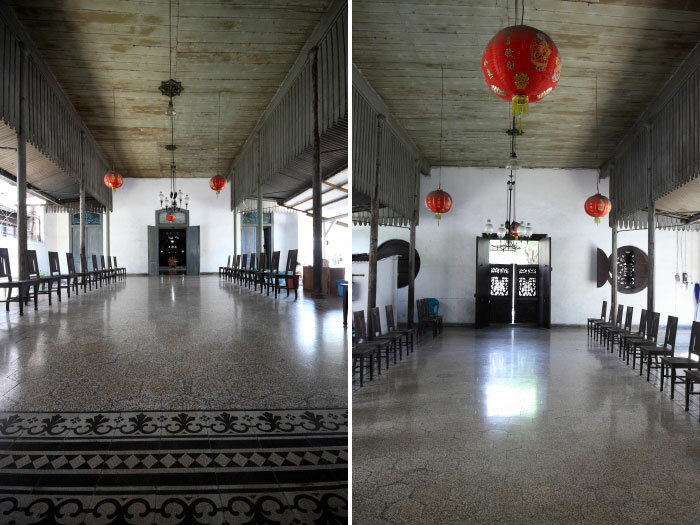 The house, locally known as Rumah Abu (literally means a building that house the ashes of the deads), belongs to the family of Han or Marga Han in Bahasa Indonesia . I wondered if that Rumah Abu Marga Han had something to do with Han Siong Kong. The Rumah Abu Marga Han was located on the street of Jalan Karet. That’s all the information I had got from the internet. I had no idea where exactly it was. The only way to find it was to walk along the street. The area was unbelievably beyond my thoughts. 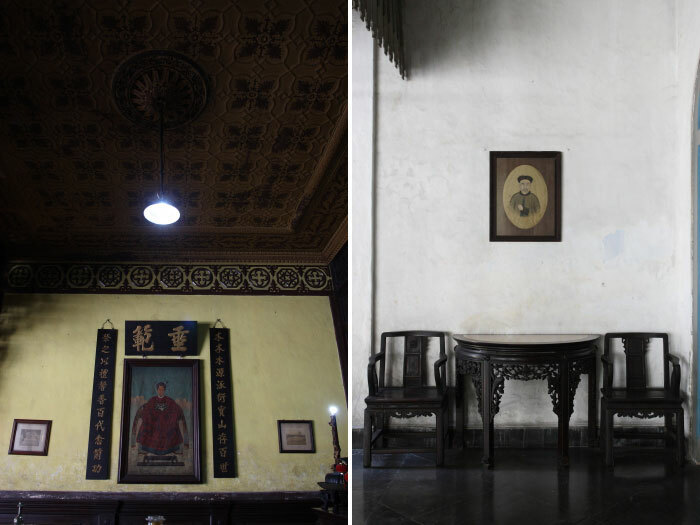 There was no sign that it was once a prominent Chinese quarter with typical Chinese shophouses on its both sides. All I saw were old warehouses covered with dust and big heavy trucks parked everywhere. I stopped by an old Chinese shop selling leather goods to ask how far I still had to walk to reach the Rumah Abu. The shop seemed to be the last commercial shop on that street. It was something left from the old days. The shopkeeper was an old Chinese man who had run the business for many years. He was so friendly he allowed me to take pictures of the shop and of course, showed me the direction to the Rumah Abu. He told me that there were three famous Rumah Abu in Surabaya. They belonged to the family of Han, The, and Tjoa. 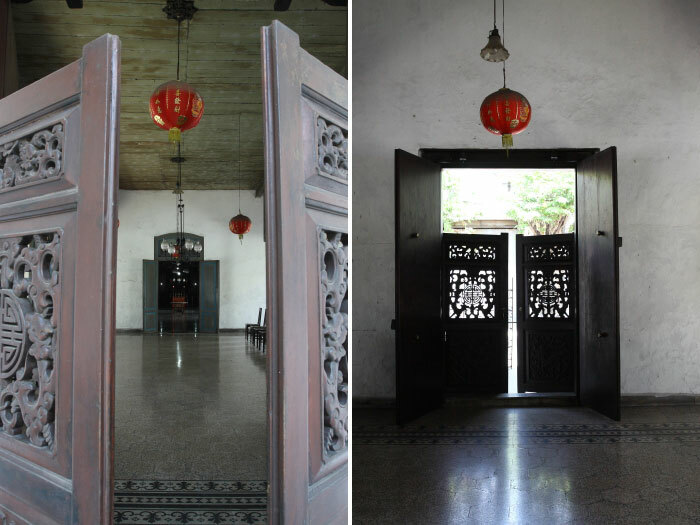 Of all those three prayer houses, the one belongs to family of Han is the biggest one and relatively open for public. He was sad however that Chinese young generation today didn’t seem to pay attention to their cultural heritages. No one came to Rumah Abu to pray for the ancestors anymore. I thanked the man and soon left the shop for Rumah Abu Marga Han. It was not hard to locate it as it had a unique Chinese architecture style compared with its surrounding. All the doors and windows were closed. There was no sign that this building was open for visitors. I stood for a while, tried to figure a way to get inside the building. I was suddenly aware that there were to guys working across the street. I asked them how to get inside the Rumah Abu. They told me to press a tiny door bell hidden above the blue door that would take me to an alley beside the building. So I pressed the bell, and a woman came out. Her name was Noni. She lived with her husband in a small tiny room beside the house. For generations, her husband’s family had worked for the family of Han. I was not allowed to enter the house right away. First, Noni called her husband to let him know that there was a visitor from Jakarta who would like to wander in that house. Then she handed me the phone and let me talk with her husband. I was glad that I was finally permitted to get inside the house. This was like a dream – come – true moment. I went straight to the centre of the house which was the main prayer hall. It was a semi open hall and yes, I had to say, it’s spacious! I felt like staying and lingering in that hall. This hall would accommodate the family members who wanted to pray the ancestors. Like typical traditional Chinese house, there was an altar dedicated for the ancestors. And of course, it faced the main entrance. I found like hundreds of ancestral tablets at the altar. Anyway, they didn’t keep the ashes of the dead ancestors in this Rumah Abu, just the tablets with their names on each of it. Two huge paintings were hung on the walls, right beside the altar. There was no written explanation about the persons in those paintings. From many blogs I had browsed around, I obtained information that the noble guy wearing a grand traditional Chinese costume in the painting was the founder of this Rumah Abu. He is Han Bwee Koo, also known as Han Bwee Kong, born in 1727 and passed away in 1778. He was a Chinese Captain, appointed by the Dutch government to lead the Chinese community in Surabaya. He was married to Tan Chi Guan and had five children. Two out of the five children, Han Tjan Pit and Han Tik Ko, were wealthy landlords in East Java in the eighteenth century. 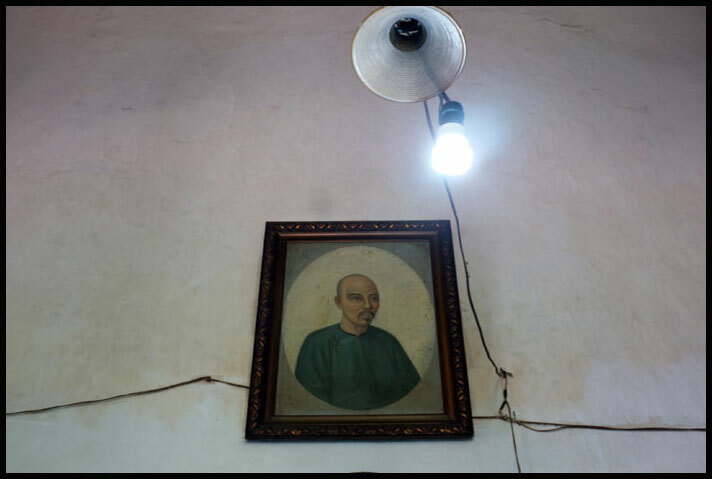 According to Ong Hok Ham, an Indonesian Chinese historian, in his book “Riwayat Tionghoa Peranakan di Jawa,” Han Tjan Pit (1759-1827), the big brother, was a Chinese captain in Surabaya, East Java. He was also a successful landlord, owning the land of Besuki and Panarukan. Those two places used to be unprofitable lands for the Dutch colonial government, and the people living there were poor and had to pay taxes. Under the rule of Han Tjan Pit, those lands became productive and profitable. Also, the people living there (I bet nearly all of them were farmers and labors at plantations) got paid for their jobs. In 1811, thanks to the successful big brother, Han Tik Ko was appointed as a Chinese Major in Probolinggo, East Java. The Dutch gave him the land of Probolinggo and required him to pay it back by installments. So he moved from Surabaya to Probolinggo and became a landlord in that place. At that time, if someone owned a land, they owned the people living on it. So Han Tik Ko automatically became the ruler of Probolinggo and asked the people to call him “Baba Toemenggoeng” and acted like a regent. Sadly for Han Tik Ko, the land of Probolinggo did not give much profit to the colonial government. He had to tax the people with high amounts of money in order to pay the installments. The people were of course furious and that led to an uprising in 1813. Han Tik Ko was killed in that riot. Besides Han Tjan Pit and Han Tik Ko, there were some “Han” who became Chinese officers in East Java. Apparently, the family of Han played a very significant roles in East Java. After exploring the main hall, I moved outside to the front terrace. This place was more like a reception hall for the guests. I couldn’t help but noticing the beautiful wood carving doors at the main entrance. It was so Chinese and antique for sure. All the floors in this house were covered with marbles imported from Italy, while the wrought iron columns were made in Glasgow, Scotland. Han Bwee Koo must have reached a certain level of prosperity that made him able to build such a luxurious prayer house like this. Before leaving the Rumah Abu, I went to a small room in the south wing. The room appeared to be a private family room with a table in the centre. There I found some pictures on the walls. What attracted me most was a picture of a Chinese man put high above. There was no information about who he was, but I guessed it’s one of the ancestors of the family of Han. One familiar picture was hanged on the other side of the wall. It’s a faded old black and white photo. I soon recognized it as of the grave of Han Siong. It’s the grave I had visited in Lasem three years earlier. So Han Siong of Lasem were likely related with Han Bwee Ko, the founder of this Rumah Abu. I moved next to the picture of the grave, still at the same wall. There was an old family tree describing the family of Han in Java. It was not easy to read it as it had been centuries old. I later found that this family tree was made on a camel leather in the 18th century. Right in the centre of the tree, I saw something that absolutely answered my whole question about the relation between Han Siong Kong and this Rumah Abu. Turned out that Han Siong Kong was the father of Han Bwee Koo. I decided to leave the Rumah Abu for another historical place in Surabaya. I thanked Noni, the caretaker for allowing me to explore the house. While riding GO-JEK, I suddenly had a thought that it was ironic that Han Siong Kong was dead in Lasem in a poor condition, and had nothing left for his children. All his children then had to get out of Lasem and moved eastward to Surabaya and other places in East Java. They became successful and never returned to Lasem, where their father landed and where they were born. And it was all because of the curse. The curse that still lasts until today. I always amazed by the fact on how you can get a permission to enter such "special" places, Mas. May I know what ethnicity are you coming from? Noo, I'm not trying to be a racist here. No need to worry. I'm just curious. Hahah. I've been in Lasem once, wandered into its alleys and one of heritage building there which turned to be an Islamic Boarding School now. Sadly, I didn't have a chance to visit that famous Han grave. A great post and photographs, Mas. As expected from you. Btw, all of your attached links in this post didn't work properly. Please, fix it. This special place in this post is actually open for public. Everyone can go in there regardless their races and religions. You should try!